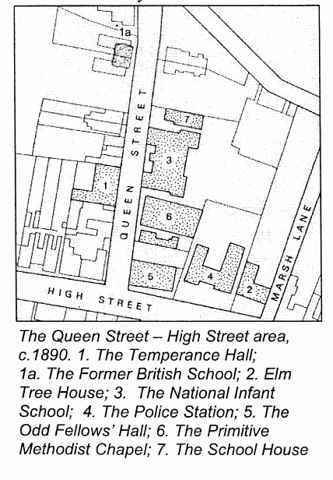 Many people appreciate the quality of the buildings in Queen Street, Barton, but a brief account of the history and development of that area of the Town, especially the School, may be of interest. During Queen Victoria's reign (1837 - 1901) there was not only a rapid rise in population but also tremendous social change in the lives of ordinary people in this country, arguably greater change than in any other comparable period. The ancient port and market town of Barton upon Humber shared in this extraordinary period of growth and change. At the centre of Barton, in the Queen Street / High Street area, there are still vivid reminders of the impact on the lives of ordinary people of the principal social concerns of the Victorian era - education, law and order, religion, self-help and temperance. Barton can boast a precious gem, a group of fine public buildings handed down from the first half of Queen Victoria's reign, which, for compactness and homogeneity, is probably unparalleled. Most market towns had buildings of a similar type, but probably none on this scale preserved in such close proximity to one another. Closely linked with these particular buildings are two figures of national and international importance, Sir Isaac Pitman, the inventor of the most widely-used system of shorthand, and Samuel Wilderspin, one of the most important pioneers of primary education. The area that concerns us here occupies the site of the former mansion and grounds of the Long family of Barton upon Humber. The house was apparently built by the wealthy mercer, William Long in the first half of the 17`h century. The plan accompanying the Enclosure Award for Barton in 1796 shows the mansion standing in extensive grounds, bounded by High Street on the south and Marsh Lane on the east, and stretching almost to Finkle Lane on the west. The property was sold piecemeal and in 1827 a road, originally known as New Road, later Queen Street, was laid out on the western part of the former grounds. One of the first buildings erected on the street was a "British" charity school in 1831. This school closed in 1842 and, following alteration about 1858, it was converted into two houses (Nos. 13 and 15 Queen Street). 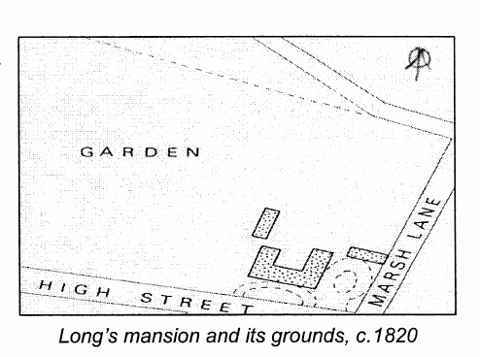 Only limited development had taken place on New Road by May 1843, when a notice appeared in the Stamford Mercury announcing the sale by auction of the mansion house, outbuildings, yards and gardens, amounting to about two acres. Following the sale, the great house and most of its outbuildings were demolished and the site was divided up. A plot alongside Marsh Lane was purchased by a local brickyard owner, George Ingram, who immediately had the present Elm Tree House built. The rest of the site was apportioned in five lots and during the next twenty-five years they were developed with a fine series of public buildings: the School (1844), the Police Station and Magistrates' Court (1847), the Friendly Society Hall (1864) and the Nonconformist Chapel (1867). These four buildings, together with the Temperance Hall built on the west side of Queen Street in 1843, still survive and form a most impressive group of early Victorian public buildings.